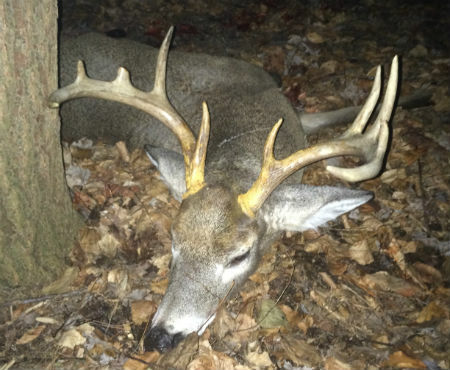 For the entire deer season of 2015, I've seen nothing that would strike awe in the average man. Doe and buck alike are not moving, the cold temps aren't making a difference, it's only making my life more miserable. I have this guaranteed afternoon stand, a ground blind that's given me a state record buck; a spot that sits on a tree line to a field, a hollow to my left, the deepest and lowest corner of the field where they can nose out at sunset in relative safety. Again, nothing all season here either, that is until I saw a small, young buck on December 12th, chasing a doe out of a swamp into neighboring field, that's just over the range of my shotgun, 200 yards through a tree and underbrush hedgerow. Not a shot I feel good about taking. Begrudgingly, the last morning of shotgun season, I moved to the neighboring field, I lay in wait in the far hedgerow with the entire field between that swamp and I. This is no ordinary swamp. It's thick, dense, thorny underbrush with a mucky mud so deep I lost a boot one year when I sunk up to my hip in one wrong step; only deer go in there, I should have known better. I'm laying in a sniper prone position in a hedgerow, my cover is a log, blocking most of my body behind it. I have my trusty New Haven 600AT, rifled barrel, cantilever scope and Hornady SST slugs, a working man's gun, tried and true, deadly accurate. I'm a coiled rattler, camouflaged and ready to strike. I spend 6 hours lying in wait, nothing happens, I thought maybe I had a chance again today of that buck doing the same in the early morning hours. I was wrong, I was cold (even with the right gear, you'll get cold if you don't move for 6 hours), and I was mad at myself for no good reason, other than I hadn't had success. At noon I make my move. A desperation takes over me, it's time for a Hail Mary pass into the end zone. I move a climber stand from deeper in the hardwoods to the edge of the tree line overlooking this new field. There's a natural opening to the field and a natural alley to my usual afternoon field to my left. This alley's exit is where the tree line dips down in that field, out of view from my ground blind to the right, another advantage to moving this climber. I'm expecting something to walk the tree line in front of me though, I get up there right away. I don't wait. The cold has set in, temperature is dropping, the wind is low for once. It's agonizingly dead, the clock ticks away. Nothing. Then it was the final hour, please, something move! Ticking away, rapidly approaching sunset time, I'm shaking my head in disgust. I now need to go to the store and buy a late season tag in order to get something. I hear something, it's a squirrel probably. I look to my left, only to see one, it figures he'd tease me now. But wait, I see movement out in my afternoon field, coming out of the corner closest to the alley, going along the trees, it's a solitary deer. He's gray, he's dark, he's got an odd colored rack. I don't have time to think about this, I need to take action. I move my scope to the opening in the alley, I've already lasered it, 101 yards, I had ample time to check my distances all day. I've checked and rechecked. I have an isosceles triangle at the end of the alley, branches and crooked tree trunks make up this window I have to shoot through. I don't focus on his movement, I swing up the gun and hold on the triangle, waiting for his body to fill that hole, he's taking his time. It feels like forever that I wait. When he's finally where I want him, I pull the trigger. But then he saunters off, arcing a semi-circle back towards the middle of the field and into the woods. There is no second shot. There is no second chance. I'm mad, I swore, cursing at myself for a crappy shot, until I rewound the footage in my head. No, I reassure myself internally, you saw him jump as you looked through the scope, get down and check out the impact site, look for sign. It takes me twenty minutes to get down, get my ATV and fly over there, there's no direct path between fields. I see nothing, I'm losing daylight, fast. I check the alley exit for hair, blood, anything. I retrace his path through the field, I'm needing a light source now because it's dusk. I check the field in front of the tree line, still nothing. I've gone from the point of impact, through the field and now to the tree line, still nothing, only fresh scrapes. Before I resolve myself to getting on my hands and knees to look for signs, I tell myself that I should take one last look in the woods, just estimate where he went in and look for a body. I go eight, then ten feet into the woods, at where I guessed he would be. I find a tail sticking up, the white hair illuminated by my light. It was him, at last. Finally a blood trail showed what hadn't been seen in the field, double lunged, through and through. Broken G3, war wounds healing on top of his head, yellowed beams from a fresh rub. He was still marking his territory, this old warrior, on his decline but holding on to life as he knew it. A clean, one shot one kill, on a mature ten point buck at the last possible minute. What an adventure both he and I had. 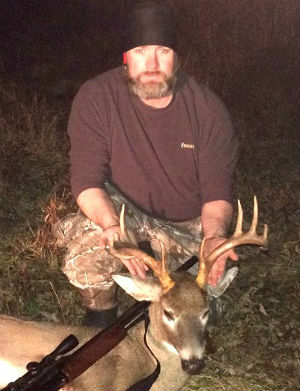 A close-up of Kevin's Tompkins County buck.